In July 1874 brothers Joseph and Frank Suiter began construction of a flour mill on the bank of the Big Blue River near DeWitt. Completed the following year, the mill was reportedly one of the largest in Nebraska. The Suiters operated the DeWitt Mill for two years before selling it in 1878, a year before it was destroyed by fire. Rebuilt by 1886, the mill formed an important commercial center for the region. 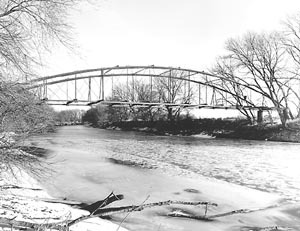 That year Gage County contracted with the King Iron Bridge Company of Cleveland to erect a single-span iron bridge at the mill. For this crossing, King fabricated a standard 150-foot, pinned Pratt through truss, supported by concrete-filled iron cylinder piers. The DeWitt Mill Bridge carried traffic unaltered until a 100-foot Pratt pony truss was added to the main truss's north end around 1920. A more recent rerouting of the county road has left the bridge abandoned, under private ownership. Its timber deck and stringers have deteriorated, but the truss and its substructure remain intact. Nebraska counties began purchasing all-iron trusses in the 1870s, and by the next decade several hundred of these utilitarian structures had been built in the state's eastern region. Subsequent attrition has been devastating, however, and all but eight iron wagon spans from the 1870s and 1880s have since been demolished or destroyed by flooding. Of these, all but the DeWitt Mill Bridge have been moved at some later date. The oldest vehicular truss remaining in the state, it is important for its representation of Nebraska's formative settlement period. 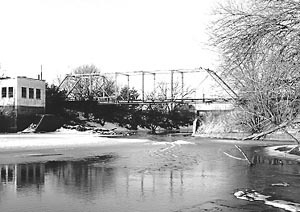 In 1870, Gage County erected its first iron bridge over the Big Blue River in the town of Blue Springs. This long-span bowstring arch-truss was apparently fabricated by the Ohio Bridge Company, using the tubular arch configuration patented by company owner William Rezner. Forming the centerpiece for the small town, the Blue Springs Bridge carried wagon traffic for twenty years before it was moved to the western edge of Beatrice, the county seat. Here it functioned for decades, before being abandoned. The bowstring still spans the Big Blue River, but its timber deck has been removed. The bowstring arch-truss was the iron span of choice for Nebraska counties in the 1870s. Marketed extensively by regional bridge builders, these often-patented bridges featured a wide range of span lengths, economical fabrication cost and relatively quick erection. The proliferation of the bowstring corresponded with the formation of Nebraska's road system; as a result, perhaps hundreds of these prototypical iron spans were built inthe state. The Blue Springs/Beatrice Bridge is distinguished as one of the last remaining examples in Nebraska of this important structural type.